At refuse district transfer station in Edgartown, fees are going up beginning next week. A decision by the Chinese government has rippled all the way to the curbside of nearly every Martha’s Vineyard home, where residents will see an immediate increase in the cost of trash pickup and recycling. Effective Jan. 1, China is no longer accepting many kinds of recyclable materials from other countries. Until recently, about 30 per cent of U.S. recyclable materials were processed by Chinese companies, which turned the bottles, cans, plastic and waste paper into raw materials that helped fuel China’s industrial boom. China now says the process of recycling caused too much pollution and that too much of the bulk recycling contained non-recyclable trash. About three years ago, Island recyclables were worth money. Companies paid to take them, though the price did not cover the cost to haul the materials by truck to recycling facilities. Still, it was far less expensive than hauling and paying a facility to take trash. Changes in the recycling marketplace were already changing the economic equation over the past few years, Vineyard solid waste managers said. But the decision by Chinese officials turned it upside down in a few short months. Don Hatch, manager of the Martha’s Vineyard Refuse District, said the economic reversal hasn’t caught up with residents yet. “A lot of people don’t realize they pay for this through their taxes; they think recycling is free and we receive money for selling it,” said Mr. Hatch. The refuse district includes Edgartown, West Tisbury, Chilmark and Aquinnah. Residents of Oak Bluffs have trash picked up by the town, but there is no curbside pickup for recycling. Oak Bluffs residents can drop off recycling at the town dropoff center at no cost save a small fee for a sticker. Residents of Tisbury have the option of hiring a private contractor for curbside pickup of trash and recycling, or having the town of pick it up. Tisbury, however, no longer provides its own service — the town contracts with Bruno’s for curbside pickup. Price hikes for trash and recycling will take effect over the next few weeks for many residents. Effective Feb. 15, the cost of disposing of a bag of trash at dropoff centers in the four towns that are members of the refuse district will increase from $4 to $5. Fees for other trash, such as tires, brush, or appliances, will also increase. There will still be no fee for separated recyclables. Mr. Hatch said the price hike is the first in more than a decade. “That price increase was scheduled for July 1, but because of this unexpected increase in the middle of our budget year, we’re doing a price increase as of Feb. 15,” he said. But it will only absorb about half of the newly-increased cost of sending recycling off-Island. As a result, town assessments will also see an increase in the coming fiscal year. The refuse district processes and ships some 7,000 tons annually of waste and construction material; about 1,000 tons of that is recyclables. Mr. Hatch projects it will cost $142,000 to transport bulk recyclables and pay a facility to take them. Revenue from stickers and dropoff fees will offset the cost by approximately $67,500, leaving $74,900 to be paid by the individual towns. That represents an increase of $35,000 over the current fiscal year. Edgartown’s assessment will increase by approximately $24,300. West Tisbury’s assessment will increase by $5,300, Chilmark by $4,100, and Aquinnah by $1,000. The total refuse district budget in 2018 is $1.54 million. The draft budget for 2019 is $1.66 million. Meanwhile, for individual customers of Bruno’s Waste Management, the cost of recycling will rise substantially. Currently, customers pay $8.95 per pickup for recycling every other week. Effective March 1, the cost will rise to $15.95 per pickup. Bruno’s is currently in talks with the town of Tisbury about amending its contract. A public hearing with the selectmen opened two weeks ago and is scheduled to continue Feb. 20. In addition to the price increase, customers will soon see stricter rules for what can be recycled. Both Mr. Forend and Mr. Hatch said they will initiate some educational efforts, including letters, flyers and lots of interaction with consumers, both at the curbside and at the dropoff centers. Plastic bags of any kind, non-food plastics, and recyclables with food waste on them, will be refused. Mr. Forend said consumers have gotten used to lax enforcement, and are going to have to get used to more careful sorting at the curbside. With the current economics of recycling, it might be cheaper to simply put recyclables in the trash stream. All the trash generated on the Island is now trucked to an off-Island incinerator and burned to produce energy. 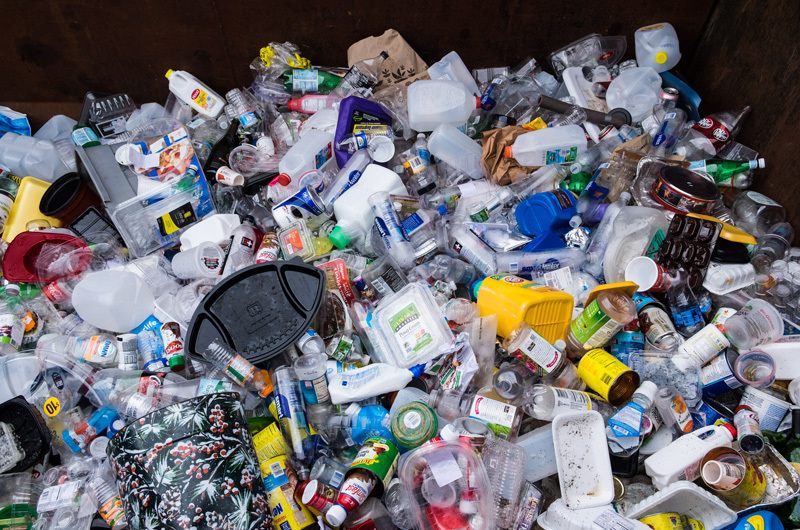 But Massachusetts regulations ban many products from being thrown away, including glass, metal and plastic containers, paper, cardboard, large appliances, televisions, and other items. State inspectors closely monitor the amount of recyclable material getting into the trash stream, and can sanction trash processors accordingly. At this point, Island officials are hoping for an economic miracle. “I’m hoping some avenues open up in the country somewhere, to relieve some of the pressure and cost before summer comes,” said Mr. Hatch. An earlier version of this story reported incorrectly on cost increases for inividual customers of Bruno’s. The increase from $8.95 to $15.95 per pickup is for recycling only, not trash and recycling. Reduce comes before reuse and recycle. That's the new reality. Reduce. I am shelled shocked to see the sticker price rise from 5.75 to 15.95. This is devastating for all. People will leave their trash everywhere. We need burn the trash. Burn trash? That's a great idea! It makes no sense to charge the same amount per ton for brush as trash. It goes into a chipper and maybe compost can be made from other yard waste. But to charge us the same as waste that gets shipped off island is a pure rip off. Brush shouldn't been thrown away as trash. As you mention, compost it. This is what happens after America and companies like Waste Management closed their processing facilities in the US and outsourced our recycling to China. This began about 15 years ago as a measure to reduce the costs of the companies (lay-off American workers) and send it to China, where it was cheaper to separate. Most US towns then began "single source" recycling collection, where everything gets mixed together, which increased the amount of "waste" that got into the recycling stream. It is now more costly to recycle. In the end, it may be cheaper for municipalities to forget about recycling and collect everything as waste. I saw this coming 15 years ago. It is a direct result of corporate greed and the seemingly endless desire to increase profits, while not caring what the results of their actions will be. 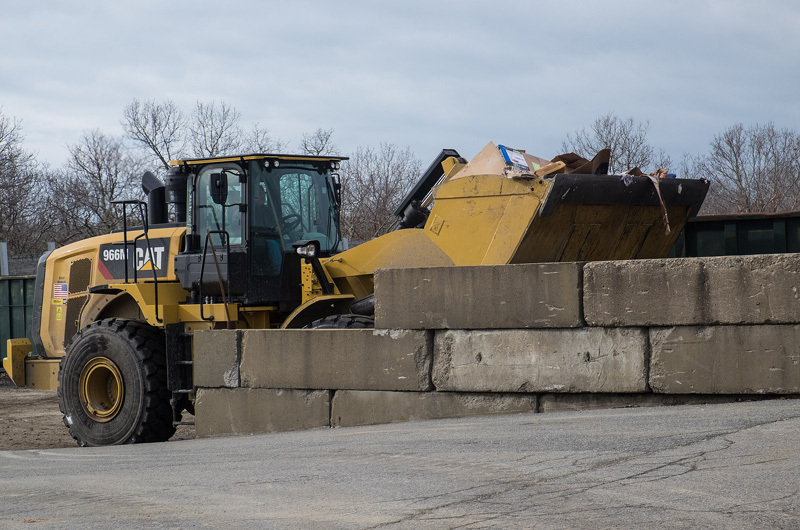 why use a 966 cat loader for Trash ? Why not use a 930 with a 7 yard snow/light materials bucket. It would use 1/2 the fuel. Because they don’t know any better?? ?oh and the taxpayers are paying for it??? Need I go on? Perhaps the machine is used for more than one purpose--sometimes heavy, sometimes light? A 930 cat will pick up a full size pickup and load it on a flatbed no problem ! I have used both a 966 is not needed,but if your going to use it put a 10/12 yard bucket on it ! Ask Peter Goodale,or Jerry the 966 is only used when striping or crushing,because it uses so much fuel . What are they doing in Europe and how do they make it pay for itself? What about in Japan? Back in the 80s, they were recycling everything in Germany: separating different colored glass, aluminum (which is insanely water- and energy-intensive to produce. I doubt they stopped doing it since that time, or are less efficient about it these days. Maybe it's time we made some investments as a country in being able to process and re-purpose our own waste? And YES: first REDUCE, then reuse, and recycle is last. Does anybody realize that one of if not the largest deposits at the dump is paper and cardboard, and our local leaders keep encouraging the use of it. I do understand the problem with plastic. Inflation is right around the corner on everything. It doesn't surprise me that the paper deposits are huge (historically, it's 80% of the recycling stream), but I'd suspect that office paper, junk mail, catalogs, and packaging (maybe even newspapers, still) make up the vast majority, with paper bags contributing little in comparison. Still, whatever contribution paper bags *do* make is worth reducing, so . . . BYO reusables, folks. Just wait until about 10 years give or take when all the solar panels we see around the Island start failing and will be needing to be removed off roofs arrays off property etc...because they no longer produce enough energy to light up a bulb...... Where will all the toxic panels go??? Maybe there will be tax incentives to remove them??? Although this article is about recycling, it is slipped in that trash disposal will increase 25%($4 to @$5 per bag) with no explanation. Why? Jim, good point. And, how about all the huge, huge, windmills, metal, electricity, salt water, the removal will be hugely expensive and the taxpayer will have to pay, as we always have to pay for unintended consequences of actions for which we do not have nor are welcome to have any input. Is the island waste brought to the SEMASS waste to energy plant in Rochester?